Wishing you all a Happy Valentine's Day peeps! We don't go too crazy around here for Valentine's but if you want to know what we do to make Valentine's special around our casa, you can read it here. One thing that I love about Valentine's is all the red that you see everywhere. Red is one of my absolutely favourite colours! I love to wear RED and add pops of it in my home. Such a fiery colour, don't you think? I even have a juicy red pair of boots from here. And a gorgeous red leather purse. Here are some inspirational RED photos, ones that I just drool over. Nothing like a red front door. A red stove -YES please! Nothing like a shot of red in your home! Hope you are having a wonderful and lovely day. I am off to finish baking cookies. I love those boots!! I love bits of red here and there as well. Have a wonderful day!! Love all the red in those pictures! Happy Valentine's Day, Barbara! Love these hits of red without overpowering the space. Happy Valentine's Day! Love your boots! Happy Valentine's Day! Love all these!! A red stove would be fun! Well... you KNOW I love your boots! All completely gorgeous, but those boots.....wow! I love them. Ps. I'm crushin' on those cute boots of yours! Red, white and black has definitely become your signature colours. I hope you never stop liking them!! Weird, I just got this post this morning so I'm late on wishing you a Happy Valentine's Day. I just love those boots Barb!! Hits of red are always welcome in my world. Hey are your cookies heart shaped? I wish I could take you along to France it would be so much fun. Carol wants to come too, what a hoot to do a DLBW trip. Can you imagine??? I am loving the red as well! It's not "TOO" red and has just the right amount of orange in it. Love Grace's headboard and the red door at Suzanne's foyer! And how can you say no to the talented Tommy Smythe? Love him! Thanks again Barb for visiting and sharing with us all your delicious cookie and pizza ideas!! 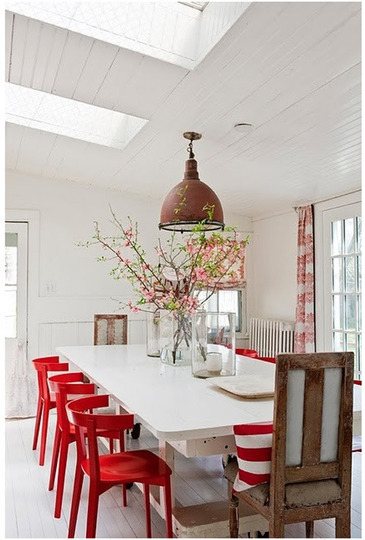 I love red as an accent! 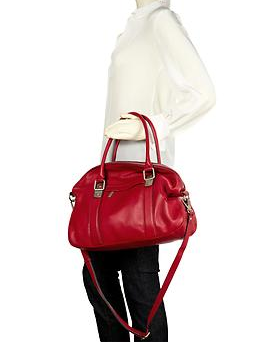 Love the red purse. I just bought one (my first red purse ever!) from White House/Black Market-do you have that store in Canada?